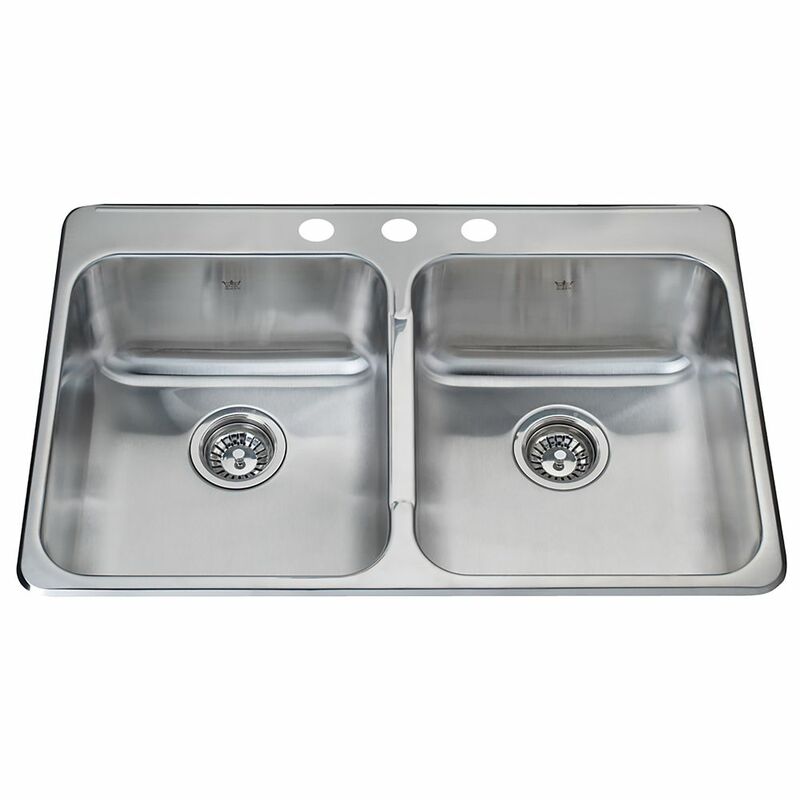 Double bowl 20 gauge stainless steel top mount sink, with faucet ledge, 3 hole faucet drilling, Spillway<sup></sup> partition between bowls to prevent water on the counter, rear drains to allow for more storage below, and easy care satin finished bowls and silk deck. Includes waste fittings, and is backed with a Limited Lifetime Warranty. Satin Double 20 Ga sink 3 hole drilling Double bowl 20 gauge stainless steel top mount sink, with faucet ledge, 3 hole faucet drilling, Spillway<sup></sup> partition between bowls to prevent water on the counter, rear drains to allow for more storage below, and easy care satin finished bowls and silk deck. Includes waste fittings, and is backed with a Limited Lifetime Warranty. Satin Double 20 Ga sink 3 hole drilling is rated 4.0 out of 5 by 1. Rated 4 out of 5 by Sara from Good size Bought this sink in November. It’s decent. Small scratches but any sink will get marks with regular use. I like the deep basins compared to what I had previously. Overall, I’m happy with the product. dimensions of sink (external) and depth. drain holes centred in the tub or placed towards the top. satin finish the same colour as brushed nickel .. satin finish The satin finish more durable scratch resistant over stainless? Good Day Darlene. Thank you for your interest in the Kindred line of sinkware and accessories . Regarding the Kindred sink model # QDL5279/20S/3 External Dimensions. 20 1/2&quot; FB and 31 1/4&quot; LR. Drain holes are located centered and at the rear of the bowl towards back wall. Satin is not the same as brushed nickel. The satin will be shinier and polished, whereas the brushed nickel looks &quot;brushed&quot; and more matte. There is no such thing as a scratch resistant stainless steel sink. All steel sinks from ANY manufacturer will be susceptible to scratching when first in use, regardless of finish. Steel sinks take time to patina , and will improve in look with time and use and care. This is why older sinks look like they never scratch., It's had time to develop it's own finish. Does this sink include strainers? Does this sink come with strainers?